The Hot Stove picked up a little steam this evening, as ex-Yank Javy Vazquez was dealt back to the NL East in a five player deal with the Atlanta Braves. The deal is pending a physical tomorrow, but otherwise it represents the first of many moves we’ll see over the next 10 days. Yankees’ fans have a strong and somewhat irrational dislike for Vazquez, but the bottom line is that he’s been one of the better pitchers in baseball this century. He’s supremely durable, throwing the second most innings in the game since 2000 (at least 198 IP for nine straight years), and a strikeout machine, trailing only Randy Johnson in K’s during that time. 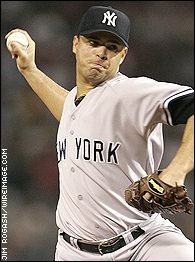 His ERA is 4.11 since 2000, just 0.05 runs higher than Andy Pettitte’s (that’s one extra run every 180 IP). Given the Braves’ current rotation situation (Jair Jurrjens and pray for rain), the move is exactly what the team needs. The ChiSox are reportedly getting three players in return, but LHP Jo-Jo Reyes and IF Brent Lillibridge are fringy guys who shouldn’t play a key role on a contending team. The third prospect, Tyler Flowers, is what makes deal worth it for Kenny Williams’ & Co. One of the best unknown prospects out there, Flowers projects to be an offensive catcher who holds his own behind the plate. He’s hit .291-.400-.488 in his three pro seasons, and he just finished annihilating the AzFL with a 232 OPS+. He instantly becomes the best White Sox prospect not named Beckham, and should render AJ Pierzynski moot no later than 2010. The Braves are also getting garden variety LOOGY Boone Logan. Boy, Kenny Williams’ trades always seem to come out of nowhere, huh? Not to be overshadowed by Javy, ex-Yanks’ draftee Matt Carson agreed to a minor league deal with the A’s and also gets an invite to Major League Spring Training. Good for him. Here’s your open thread of for the evening, talk about the trade or anything else here. Just pay play nice.